A cosmic impact event at ∼12,800 Cal B.P. formed the Younger Dryas boundary (YDB) layer, containing peak abundances in multiple, high-temperature, impact-related proxies, including spherules, melt glass, and nanodiamonds. 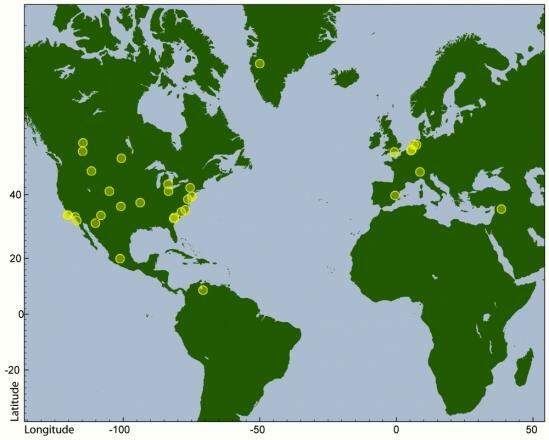 Bayesian statistical analyses of 354 dates from 23 sedimentary sequences over four continents established a modeled YDB age range of 12,835 Cal B.P. to 12,735 Cal B.P., supporting synchroneity of the YDB layer at high probability (95%). This range overlaps that of a platinum peak recorded in the Greenland Ice Sheet and of the onset of the Younger Dryas climate episode in six key records, suggesting a causal connection between the impact event and the Younger Dryas. Due to its rarity and distinctive characteristics, the YDB layer is proposed as a widespread correlation datum. The Younger Dryas impact hypothesis posits that a cosmic impact across much of the Northern Hemisphere deposited the Younger Dryas boundary (YDB) layer, containing peak abundances in a variable assemblage of proxies, including magnetic and glassy impact-related spherules, high-temperature minerals and melt glass, nanodiamonds, carbon spherules, aciniform carbon, platinum, and osmium. Bayesian chronological modeling was applied to 354 dates from 23 stratigraphic sections in 12 countries on four continents to establish a modeled YDB age range for this event of 12,835–12,735 Cal B.P. at 95% probability. This range overlaps that of a peak in extraterrestrial platinum in the Greenland Ice Sheet and of the earliest age of the Younger Dryas climate episode in six proxy records, suggesting a causal connection between the YDB impact event and the Younger Dryas. Two statistical tests indicate that both modeled and unmodeled ages in the 30 records are consistent with synchronous deposition of the YDB layer within the limits of dating uncertainty (∼100 y). The widespread distribution of the YDB layer suggests that it may serve as a datum layer.